Drawing from his teenage years, Todd Strasser’s novel revisits a tumultuous era and takes readers on a psychedelically tinged trip of a lifetime. 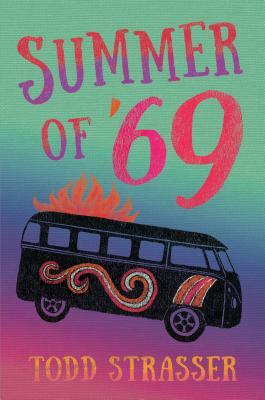 With his girlfriend, Robin, away in Canada, eighteen-year-old Lucas Baker’s only plans for the summer are to mellow out with his friends, smoke weed, drop a tab or two, and head out in his microbus for a three-day happening called the Woodstock Music and Art Fair. But life veers dramatically off track when he suddenly finds himself in danger of being drafted and sent to fight in Vietnam. If that isn’t heavy enough, there’s also the free-loving (and undeniably alluring) Tinsley, who seems determined to test Lucas’s resolve to stay faithful to Robin; a frighteningly bad trip at a Led Zeppelin concert; a run-in with an angry motorcycle gang; parents who appear headed for a divorce; and a friend on the front lines in ’Nam who’s in mortal danger of not making it back. As the pressures grow, it’s not long before Lucas finds himself knocked so far down, it’s starting to look like up to him. When tuning in, turning on, and dropping out is no longer enough, what else is there? Todd Strasser is the internationally best-selling author of more than one hundred books for children and teens, including Fallout and The Beast of Cretacea, as well as the classics The Wave and Give a Boy a Gun, which are taught in classrooms around the world. He lives in Westchester County, New York. Strasser perfectly captures the golden haze of youth and life on the cusp of adulthood. Readers fascinated with this time period will find much to enjoy. All main characters are white, but Lucas' African-American conscientious objector counselor, Charles, offers his perspective on the war and the treatment of African-American soldiers. Vietnam, Woodstock, road trips, and acid trips: a sweetly bittersweet, surprising, even melancholy bildungsroman set against a world in flux. Groovy, man. Strasser convincingly depicts the experience of the war and the opposition to it, the hippie culture of Woodstock, and the reality of using drugs. Much of the book is based on his personal experience as he explains in the author’s note. Strasser realistically portrays Lucas coming of age in the tumultuous free love defined by Woodstock.